Libocedrus (Lat. 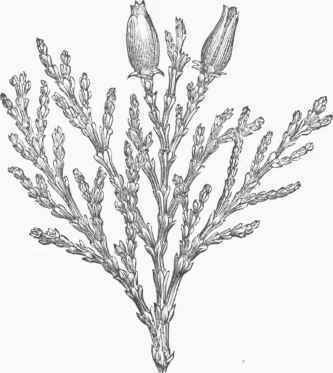 libanus, frankincense, and cedrus, the cedar), a small genus of evergreen coniferous trees, resembling the thuja or arbor vitae, from which it mainly differs in the structure of the small cones, the scales of which do not, as in thuja, overlap at the edges. Two species are found in New Zealand, two in the mountains of Chili, and one in the sierras of California, where it is abundant in some localities, but is seldom found at an elevation below 4,000 or 5,000 ft. Our species was first made known by the collections of Fremont, and was by Torrey named L. decurrens; the bases of the small, acute, scale-like leaves being decurrent upon the stem in a manner which readily distinguishes it from other trees of similar appearance. It grows to the height of 120 to 140 ft., with a trunk 6 or 8 ft. in diameter, and perfectly free from branches for 80 to 100 ft. The wood, which is yellowish, is highly valued, and is regarded as even superior to redwood in durability; the Californians call it "white cedar," a name which properly belongs to a very different tree. The bright glossy green of its foliage, and the graceful habit of the tree when young, make this one of the most ornamental of evergreens, and it would be in great request were its hardiness well established; it has proved hardy in the vicinity of New York, but not so at Rochester. Both English nurserymen and authors strangely confound this tree with thuja gigantea; the two are readily distinguished by the character of the leaves already mentioned. The exotic species are less hardy than the Californians and, while they may prove useful in the southern states, are of no value to northern planters.